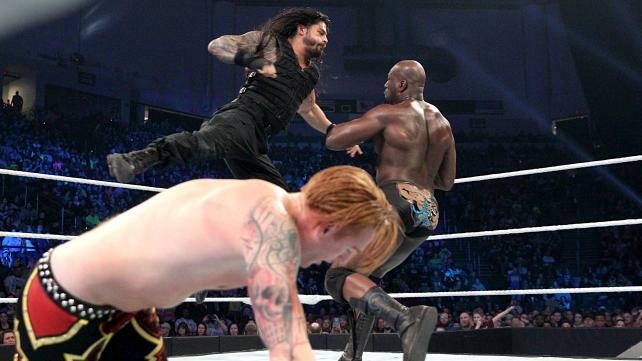 WWE: SMACKDOWN 2/12/15 Recap!! Tag Team Turmoil Fun!!! The Authority once again knew that they knew what was best for business as the WWE rolled into Dayton, OH for this week’s installment of SMACKDOWN! With Fastlane less than two weeks away, how would the WWE’s Tag Team division determine which team was the most dominant? This action packed evening was but another opportunity to showcase the skills that would set the A+ players above the B+ players. Who rose to the occasion and who was sidelined? Find Out Now!! In an odd turn of events, Smackdown began in the locker room. Kane acted in his capacity as Director of Operations and representative of the Authority and gathered the WWE’s tag team division for a meeting. He informed them that on Smackdown, they were going to be given the opportunity to prove which of them was the most dominant tag team. They would all be competing in a Tag Team Turmoil match! What is a tag team turmoil match? Two teams start. When there is a winner, a new team comes out to battle the victors of the previous fight. And it continues till there is only one winner and all the other teams have been defeated! Tonight’s match would begin with the team of Roman Reigns and Daniel Bryan vs a randomly drawn opponent from the tag team division. Kane informed the gathered men that each of them were being given a chance to showcase their skills and abilities. That any one of them could win this match, that this was their chance to seize greatness and be set a part from the pack. If Miz and Mizdow won, they could see themselves back in the tag team title hunt. If the Ascension won, they could make a name for themselves. For Heath Slater and Titus O’neil, this was a chance to reinvent themselves. And a win for the Usos would prove that they deserved their tag titles as the best in the division.Kane further fired up the teams by telling them this was their chance to make an impact and to get it done! 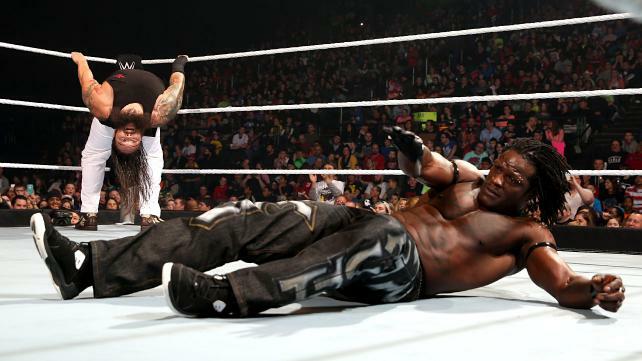 Bray Wyatt looked anything but impressed as R-Truth came down to the ring with his usual fan fair. As the match began, Bray went to over power the energetic Truth, but was met with an offense attempt from Truth that looked promising but ultimately ended in failure with a big right hand from Wyatt that sent the rapper to the mat. Wyatt would stalk his opponent and continue the punishment with brutal jabs as Truth lay against the middle rope. But R-Truth still had a bit of fight in him. His offense began with his signature dancing and he was able to trick Wyatt over the top rope. Bray would further find himself in trouble as R-Truth caught him with a heel kick to the face and a jaw breaker moments later. But as good as he is, R-Truth could not bring it home. A wicked clothes line put an end to the offensive momentum he had built up and Bray Wyatt capitalized. One Sister Abigail later and Truth was pinned. When one hears that R-Truth is going to be in a match against the Eater of Worlds, one (such as myself) would assume it would be a squash match. But the WWE Universe was pleasantly surprised. Truth held his own and pulled off a decent match against Bray Wyatt. He ended up losing, as was to be expected, it’s R-Truth after all. But it wasn’t the steam roll I expected it to be. He got in a little offense and even a pin attempt so i give the guy props for not rolling over and dying. And good on Bray for having fun with it. One can tell that the destruction of another human being really brings a gleam to his eye. Let’s hope that who ever Wyatt’s cryptic messages are to, that he’s watching and taking notice of what lay before him in Bray Wyatt. So Paige and Summer Rae lock up in Diva’s competition for some odd reason (I suspect it’s Total Divas related…). Paige dominated the blond in the early goings of the match and proceeded to continue the punishment showing why she was the #1 contender for the Diva’s championship. Paige however, allowed herself to be distracted by the Bella twines (who were on commentary) and Summer caught the anti-diva with a kick to the face that shifted momentum in the former dancers favor. Rae was able to lock in an Indian Death Lock but Paige was able to battle out of it. The pale diva took control of the match and then locked in her PTO to gain the submission victory over her Total Divas cast mate. As a diva’s match it was decent. But I’m going to give the nod on that to Paige. There is just something about Summer Rae in the ring that makes my skin crawl. Watching her in the ring is like visual nails on a chalk board for me. I’d rather sit through a Bella match than watch Summer Rae in the ring. Paige on the other hand I could watch all day. Her skills and abilities and the way she moves in the ring are second to none. This chick knows how to use the ring to it’s fullest. This match as I said, was decent though. It didn’t bore me to tears. However, the Bellas on commentary took away from the action. The announcers were too busy talking to Nikki and Brie it’s like they forgot a match was taking place in the ring. Which is sad because as main roster divas matches go, this one wasn’t that bad. Once again, Adam Rose faced Fandango in singles competition. Why? good question but they did have a short back and forth match that saw an aggressive Rose dominate the dancer for a good portion of the match. But Fandango turned it around with a series of punches and clothes lines that kept the party god on the defensive. The end came for Adam when he was powerslammed and set up for Fandango’s finisher, the Last Dance (a leg drop from the top rope). Fandango picked up the win and the Rosebuds got beat up again as Adam let out his frustrations. It was short and to the point. And here’s a spoiler, it was a good match. People will probably disregard it because it wasn’t the main guys we all care about, but both Adam Rose and Fandango put on a good showing on Smackdown. Do we know why they seem to have issues with one another? Nope. Do we care? Nope. Did I enjoy the match with out being emotionally invested in it. Yep. Do I care a little more about what happens between these two? Not so much, but I will always appreciate a match put on by two guys who work their asses off to entertain me. So kudos to these two. The question on everyone’s minds, Could Roman Reigns and Daniel Bryan co-exist as team mates to survive this tag team turmoil match? Earlier in the night, it was stated that the two would team up together to begin the bout against a randomly drawn opponent. Well, their first opponent ended up being the Miz and his personal assistant Damien Mizdow! Mizdow would get his time to shine in the spot light as a frustrated Miz, tagged in his partner. But as Damien began to use Miz’s move better than the Miz, the actor tagged himself back into the match. Bryan and Reigns continued their game of one ups man ship at the expense of the Miz as both men hit their signature moves on the Hollywood A Lister, but it would be Bryan that picked up the pinfall as he stared down his Fastlane opponent. They next team out to face the Samoan Superman and the leader of the Yes Movement, The Usos. This was a hard fought battle that saw the fragile lines of communication between the Garden Gnome and his partner tested to nearly breaking. At one point the two nearly came to blows as Bryan, giving into his vicious wild goat like nature, began to mercilessly attack the prone forms of both Jimmy and Jey outside the ring. This forced Roman to intervene on his cousins’ behalf as he yelled at The Beard to win it in the ring. The battle would continue as the two teams clashed. 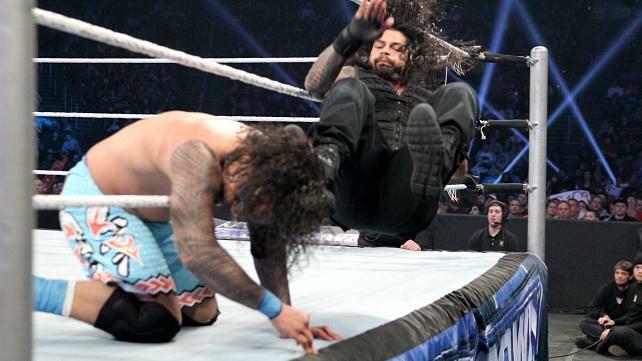 The Usos had the upper hand on Daniel Bryan and went for a pin attempt, but it was broken up by Roman. This upset his cousins (I wonder why, I mean Roman, while family is NOT on their team and is trying to win the match too…) and heated words were exchanged that made Roman forget his sympathy for his family as he began to wail on both Jimmy and Jey and even hit a basement drop kick on Jimmy Uso. This allowed Jey to land a suicide dive on Reigns, but Daniel followed it with some air goat action on the Uso brother. As Jimmy surveyed the carnage, he was about to fly over the top rope himself but caught a Superman Punch for his hesitation. A super kick from Jey ended that shift in momentum, but D-Bry was not finished as he climbed to the top rope, but caught a super kick as well. This set up the hairy troll for the Usos’ signature splash but Bryan got his knees up and locked in the Yes Lock on one half of the tag team champions. Jey tapped, and Roman Reigns and Daniel Bryan advance. This one was all Daniel Bryan. Reason? Reigns refused to tag in. Reason being, he was still upset that Bryan had held his cousin Jey in the Yes Lock longer than necessary after he tapped. It was a quick match that saw DB lock in a variety of submission holds but it was the Yes Lock again that earned the quick victory over Los Matadores. This one belonged to Reigns. Daniel Bryan showed what he could do against one team, so Roman took it upon himself to show Bryan that he could not only take on a team by himself, but a stronger team in Heath Slater (okay maybe not Heath) and Titus O’Neil (what? the man is an underrated beast) That being said, it was the one man band of Heath Slater who took the brunt of the punishment as Titus was knocked fromt eh ring apron in the early seconds of the match. One Samoan Drop and a superman punch to a returning Gator, and a spear to Slater, saw the team of Daniel Bryan and Roman Reigns advance once again in the Tag Team Turmoil match. FINALLY! I get to see the Ascension in a match against two opponents who I would say are going to make their time in the ring worth it. But Konor and Viktor had different ideas. They came out with one goal, hurt Bryan and Reigns. They didn’t care about winning or having a match as they sent Roman over the announce table and Daniel crashing into the barricade. The most dominant tag team in NXT history would then introduce both Bryan and Reigns to the ring post at a high rate of speed. At this point the referee decided to disqualify my beloved Ascension (for what I’m still not sure. I was having fun, and so where they) But Viktor and Konor were not finished. Before the officials could force them to leave the Fall of Man was preformed on Daniel Bryan. So… via disqualification, Bryan and Reigns advance. 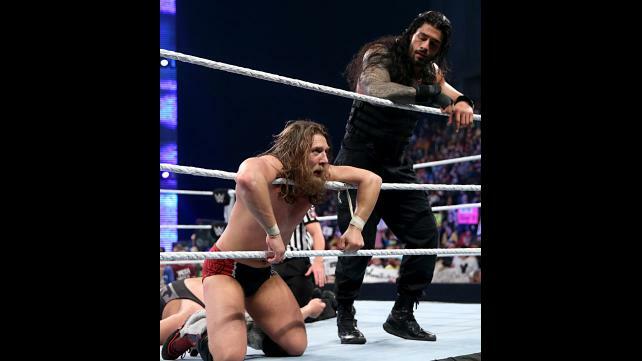 In the last match of this Tag Team Turmoil, Daniel Bryan and Roman Reigns faced their toughest challenge of the night. 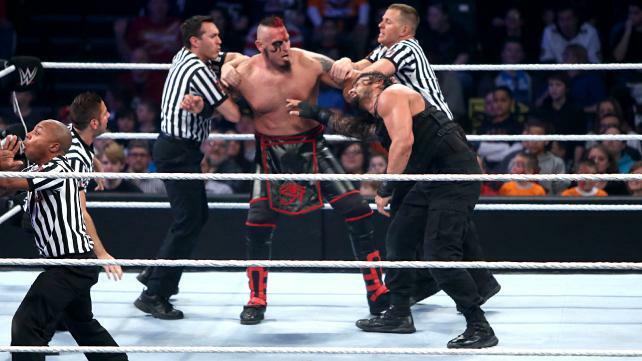 The Big Show and Kane came down to the ring hellbent on continuing what the Ascension had started. But the beating they had sustained seemed to mend the lines of communication between the two Fastlane opponents as they began to work as a cohesive unit when it mattered the most. A visibly worn out Reigns began the match against a fresh and well rested Kane. The Corporate Demon wasted no time in pummeling the Big Dog to the mat with hard right hands and viscous kicks. Daniel Bryan was eventually tagged in and he delivered his hard hitting kicks to his former team Hell No partner, in an attempt to wear the big man down. But Kane ducked the last kicked, shoved Bryan into the ropes and then landed a big boot that flattened the goat as he bounced off the ropes. The Authority representatives would then isolate Bryan in their corner and continue to punish him and cut him off from his partner. However, as perfect as things appeared on the side of right, communication broke down between the World’s largest athlete and the Corporate Demon as Kane threw the garden gnome into the ropes, but also into Big Show accidentally. Show did not take too kindly to having a goat thrown at him and expressed his displeasure to his team mate. But a double elbow to Bryan showed that they could still work together despite the accident. With Show now the legal man, he went to deliver what would have been a match winning big splash from the second rope, however Kane had different ideas as he tagged himself in, much to the displeasure of the giant. The dissension between the two gave Bryan precious moments of recovery and as Kane went to begin his attack, Daniel locked in the Yes Lock on the Director of Operations, nearly picking up the win if Big Show had not intervened. Kane tagged in his partner and Show went to deliver a choke slam but Bryan countered into the Yes Lock on the bigger man, but Kane saved the match for his team. When confronted about nearly costing his team the match, Big Show then over reacted and gave a knock out punch to Kane. As the Big man turned around, Reigns hit him with a huge spear and this allowed Daniel to hit the running knee to Big Show to pick up the victory via pinfall. The entire Tag Team Turmoil match was so much fun to watch. Against all the odds and their inability to stay on the same page for the duration, Roman Reigns and Daniel Bryan beat all the other teams. So I have a few questions. Since they beat the Usos, aren’t they due a title opportunity? (I know it wouldn’t happen but in theory it could. And I would call them Team Super Goat <.<) The Ascension was not pinned nor did they submit, so being the only team to not get pinned or submitted, does that mean THEY are the most dominant tag team on the roster and do THEY get a title shot? (I’m sure the Usos hate me right now, but they are fighting champions and should welcome all comers) How will the Authority handle what happened between Big Show and Kane. Those two had a chance to really hurt both Reigns and Bryan but their inability to work with each other and let their egos get in the way of business cost them the match and put D-Bry and Roman back on the same page. We’ll see come Monday. Heads are guaranteed to roll for this mistake. This entry was posted on Sunday, February 15th, 2015 at 2:36 pm	and is filed under Events, News, Television. You can follow any responses to this entry through the RSS 2.0 feed. You can skip to the end and leave a response. Pinging is currently not allowed. « Buckle In And Check Out The Terrifying Trailer For Guillermo del Toro’s ‘Crimson Peak’! !